Bpifrance and the European Investment Bank (EIB) Group are strengthening their commitment to the Investment Plan for Europe with two new agreements: support for technological industrialisation via the creation of the first European investment platform and financing of innovative SMEs and midcaps with the renewal of the InnovFin SMEG agreement. 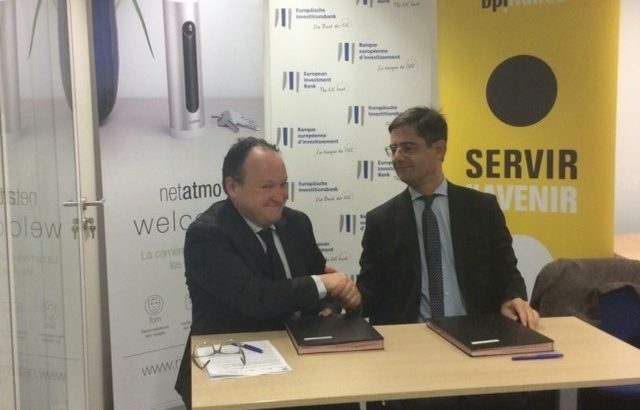 The signing ceremony took place at the premises of Netatmo, a company specialising in connected devices and a beneficiary of the first InnovFin agreement. Two financial agreements worth more than EUR 1bn were signed by EIB Vice-President Ambroise Fayolle and Nicolas Dufourcq, CEO of Bpifrance, with a view to boosting equity investments in the industry of the future and increasing the volume of loans to innovative French small and medium-sized enterprises (SMEs) and midcaps. These two operations have been made possible by a guarantee from the EU budget put in place as part of the European Fund for Strategic Investments (EFSI), a component of the Investment Plan for Europe (also known as the Juncker Plan). These two agreements strengthen Bpifrance and the EIB Group’s action in these two key segments of the innovation economy which entail higher risk exposure. As part of the Investments for the Future Programme, in early 2015 the Government and Bpifrance created the industrial SPV (special-purpose vehicle) fund to invest in technology industrialisation projects that are growth and job creation drivers. This industrial SPV fund complements venture capital and development capital tools by concentrating its efforts on the industrialisation phase of a technology. By making astute minority investments in SPVs together with one or more partners, the industrial SPV fund acts as a tool to help create the industrial positions of tomorrow and new industrial jobs. With EUR 700m at its disposal to create the sustainable industry of the future, the fund has already invested EUR 160m in five projects in sectors as diverse as renewable energies, biotechnology and green chemicals. This initiative attracted the attention of the European Fund for Strategic Investments, which aims to correct market failures by supporting strategic investments, particularly in innovation. The EIB industrial SPV fund – with capital of EUR 100m – was created to bolster the activities of the industrial SPV fund by expanding its reach and raising its status. To this end, it is the very first “investment platform” (a structured investment agreement enabling investor resources to be pooled and several projects to be financed) supported by the EFSI. The two Bpifrance-managed funds are designed to work hand-in-hand, making joint investments in industrialisation projects. Together, they will be able to make around 20 investments. the Seed Capital Loan (SCL), with lending capacity of EUR 100m and 40% guaranteed by the EIF, will make it possible to strengthen the financial structure of start-ups soliciting funds from informed investors and to assist with their development by granting additional financing of up to EUR 1.5m. Since they offer the most favourable financing terms, the IL and SCL programmes have made it possible to support almost 850 companies in 17 months, demonstrating the strategic success of these tools. The signing ceremony ended with a tour of Netatmo, a company specialising in connected devices and well-being, founded in 2011 by Fred Potter and Jean-Pierre Dumolard and the beneficiary of an Innovation Loan to finance the commercial acceleration of their latest innovation: Welcome, an indoor security camera with face recognition. On the strength of its expertise and the financial attraction of its AAA rating, the EIB Group has established itself as a key player in the recovery through investment in Europe – and especially in France where it provided nearly EUR 8.7bn of new loans in 2015, with 46% of its activities dedicated to climate action. The EIB Group’s exceptional effort in 2015 to support the real economy in France was conducted in concert with its public and private-sector partners. Since 2015, the EIB Group has been the operator of the Investment Plan for Europe. The projects financed by the European Fund for Strategic Investments (EFSI) have a higher risk profile, since the aim is to support investment in certain sectors of activity of vital importance for the future of the European economy, such as innovation and the industry of the future. The Investment Plan for Europe is gaining momentum in France: 37 projects totalling EUR 2.8bn have already been approved, and should mobilise investments of more than EUR 15bn. • help develop an entrepreneurship-friendly environment. With Bpifrance, companies benefit from a powerful, efficient local player to meet all their financing, innovation and investment needs. Under Horizon 2020, the EU research programme for 2014-20, the European Commission and the European Investment Bank Group (EIB and EIF) launched a new generation of financial instruments and advisory services in 2014 to help innovative firms access finance more easily. Until 2020, “InnovFin – EU Finance for Innovators” is offering a range of customised products which will make available more than EUR 24bn of financing support for research and innovation (R&I) by small, medium-sized and large companies and promoters of research infrastructure. Overall, this finance is expected to mobilise up to EUR 48bn of investment in research and innovation. Backed by funds set aside under Horizon 2020 and by the EIB Group, InnovFin financial products are used to support R&I activities, which by their nature are riskier and harder to assess than traditional investments, and therefore often face difficulties in accessing finance. All are demand-driven instruments, with no prior allocations between sectors, countries or regions. Firms and other entities located in EU Member States and Horizon 2020 Associated Countries will be eligible as final beneficiaries. News from the members. permalink. Read all about our activities in 2017!